A few months ago our trusty cookie scoop finally died after years of faithful service when the plastic spring mechanism gave out. A quick trip to a local home store found us a replacement - the OXO Good Grips Cookie Scoop. At close to $15 in the store, it was at the higher end of the price range, but featured all stainless steel construction (including a metal, as opposed to plastic spring) and the signature OXO comfort grips. After scooping out at least 500 cookies with the OXO scoop, it is definitely one of our favorite kitchen tools - it washes easily in the dishwasher and has a great spring action. For those who still rely on spoons to scoop out cookies, you don't know what you are missing. 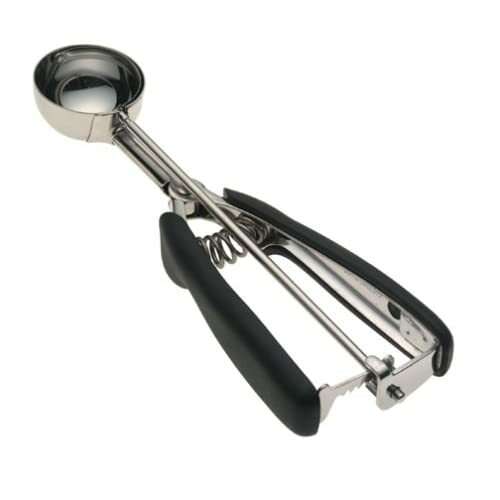 Our only complaint is with the handle based spring mechanism: while it saves stress on your thumb, you can sometimes accidentally squeeze it when trying to scoop thick batter out of the bowl. Note that at our local home store, only the medium size was stocked - Amazon also carries the small and large sizes depending on your baking needs and offers them at a better price. A cookie scoop makes the perfect gift to treat yourself, the baker, or cookie monster in your family! Attention Holiday shoppers - Amazon is running a special on kitchen items - if you buy 4 select items you get one of them free!